Swedish Touring Car Championship (STCC) season leader Johan Kristoffersson, driving a biomethane powered VW Motorsport Scirocco, and last season champion Rickard Rydell in a Chevrolet Cruze, remain locked in a struggle for dominance after exciting races last weekend at the Östersund circuit in Sweden. Kristoffersson, driving for Team biogas.se, took second place in the opening race before collecting further valuable points in the second race after finishing sixth. His team mate Jordi Gené also produced a strong performance and clinched a fourth and second place finish. Johan Stureson of IPS Team Biogas finished the second race on the podium in third place. After the fifth of eight races this season Kristoffersson now leads with a total of 172 points, 8 points ahead of Rydell. 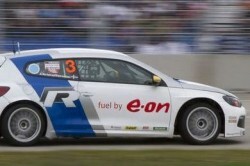 Biomethane powered Sciroccos occupy 1st, 5th, 6th and 7th on the championship table.